Since our kids aren't old enough to be on a real school schedule we get to enjoy taking vacations at odd times of the year. So instead of dealing with the crowds during Spring Break we take our vacations a little later in the Spring. We just got back from the "Beach House" (as Austen and Peyton) called it in Outer Banks, NC. Now this is the second time we made the trek to OBX (as it is affectionately called). In fact, the first time we went Austen was Peyton's age. We had a great time that year so we decided to try staying in Corolla this time...which is a little more off the beaten path compared to Kitty Hawk. Our drive (since we bring Adler) was pretty uneventful at least the first three hours and until we drove over something in the road. We didn't know it until about 20 minutes later but it lodged a screw or a nail into our tire that caused it to start to deflate. Luckily, we were just entering a toll booth when we noticed that we had a flat tire. Tom quickly changed the tire to the spare (not a full size) while I entertained the kids and quickly tried to locate a tire shop that was open on a Friday night. This happened at about 6 p.m. so it was still light out for changing a tire but well past the 5 o'clock quitting time of most tire places. Anyway, thank God for smart phones. I located a recovery and towing place about 15 miles up ahead and we managed to drive about 55 mph on the spare to get to it. The bad news when we got there was that the tire was not patchable (something they could've easily done at the shop) so we had to drive to the local Walmart another 15 minutes away to buy a tire at this late hour. We gassed up the car, bought the kids some Happy Meals as well as the tire and headed back. Lucky for us the shop didn't have any recoveries to run out to so they were pretty quick in putting the new tire on the car. Three hours later we were back in business but that delay meant we would have to drive well into the night to make our evening destination - Cumberland, MD. We planned to stop driving about midnight CDT but with the delay, we were now shooting for 3 a.m. CDT. This was going to be a long night. Here is Austen checking out the tire. And, Peyton entertaining herself with the iPad. 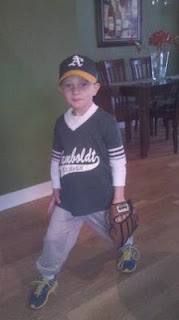 This year we signed Austen up for a different baseball league. His friends all played in this league last year and they raved about the mini Wrigley Field stadium complete with astro turf and cute uniforms. So last Saturday I sat outside for his first game in the rain (seriously, I didn't think they let 5 year olds play in the rain!) and thought this is the first of many years I will probably be sitting in the rain watching my kids playing something! Anyway, Austen did great. He is one of the older kids so he dominated the game - scooping up the ball and running kids down who were headed to first to tag them out. I wanted him to be more of a team player so I was telling him he needed to throw the ball to first but when he did that the first baseman missed so the next time he decided to roll it to him! He got some great hits too and even slid into home plate! I think he's going to have a fun season! When is it Kids Day? Usually we spend Mother's Day honoring our moms by driving from house to house and it not really feeling like it's a day for me. This year was different. I enjoyed a spa day and dinner with my mom on Saturday, and on Sunday morning, I got to sleep in. I also got breakfast made for me and time to enjoy the day with just our family. We went to the bookstore so I could pick out a new book and strolled through a couple of stores at an outside mall. The day was beautiful and it was exactly how I wanted to spend Mother's Day. Austen and Peyton were well aware it was Mother's Day today and a day to honor me although I'm not so sure that impacted their behavior but it sure was cute when Tom said that I get to choose what we were doing because it was Mother's Day. Austen promptly replied, "Awwww....when is it going to be kids day so we get to choose what we want to do?" Hey, Austen, everyday is kids day...life is all about you and your sister and Adler! That's why we had you!